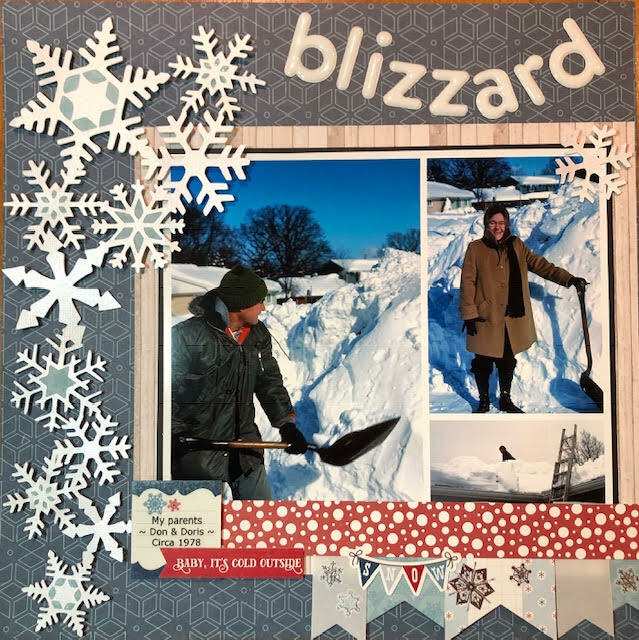 If you love DIY Crafts as much as we do, you’ll love these winter scrapbook and paper craft ideas that our talented designers came up with using our January ScrapBooking Store club kit. We’ve highlighted some of our favorites below, with descriptions in the Designer’s own words. 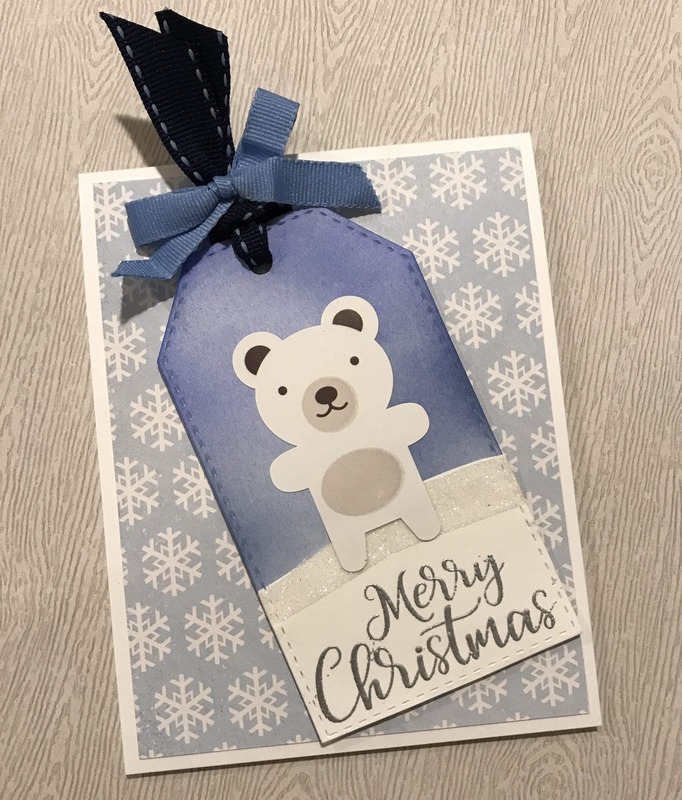 I used the bear sticker element to make a winter scene tag. 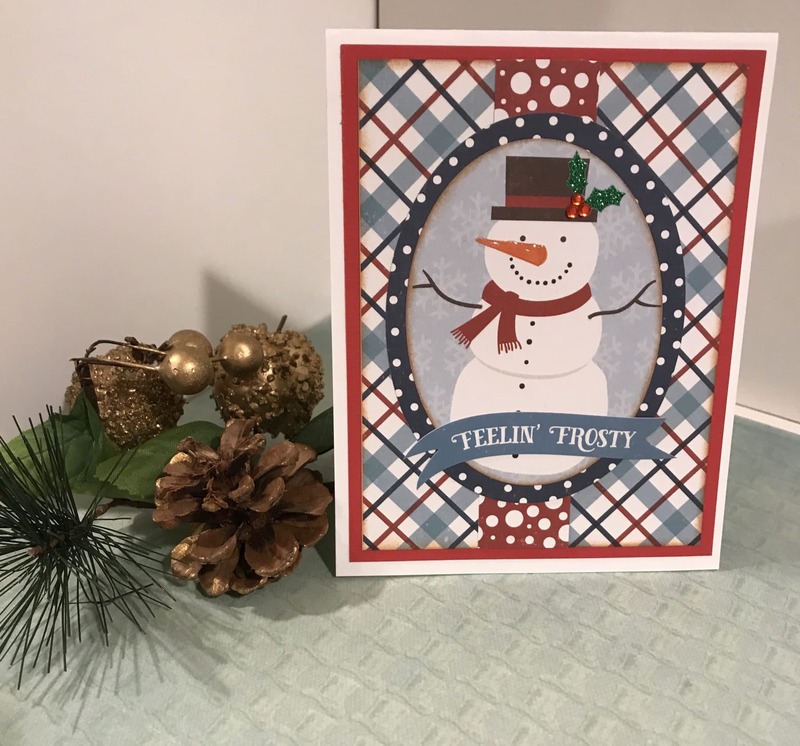 I stamped and embossed “Merry Christmas” using silver embossing powder. I then tied some coordinating ribbon onto the dies and adhered it to the beautiful snowflake patterned paper that was in the kit! I think this card is so cute! Don’t you! These photos of my twins playing in the snow reminds me that to them snow is magical! They only see it once a year, so I definitely have to preserve that moment for them! These clear snowflake stickers made the perfect background for my cluster of photos. I used mostly blues with small pops of red so that the bright pink in my photos really pops! Absolutely love that little bear peeking out! 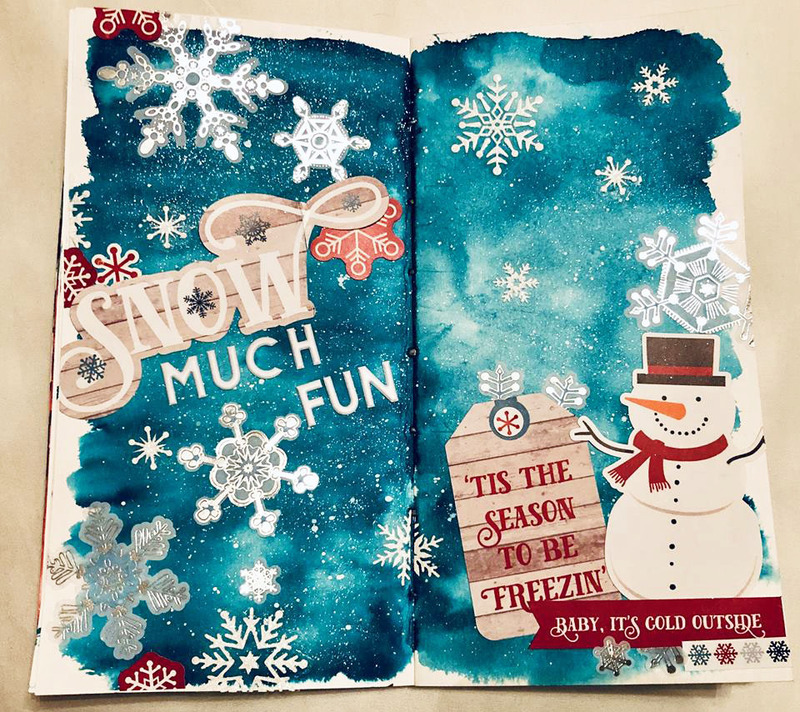 I wanted to do a little art journaling using my January Kit; something a bit wintery since it’s that time of the year. I began by creating my background using a Jane Davenport mermaid marker and adding a bit of splatters with white ink to create a snow-like background . 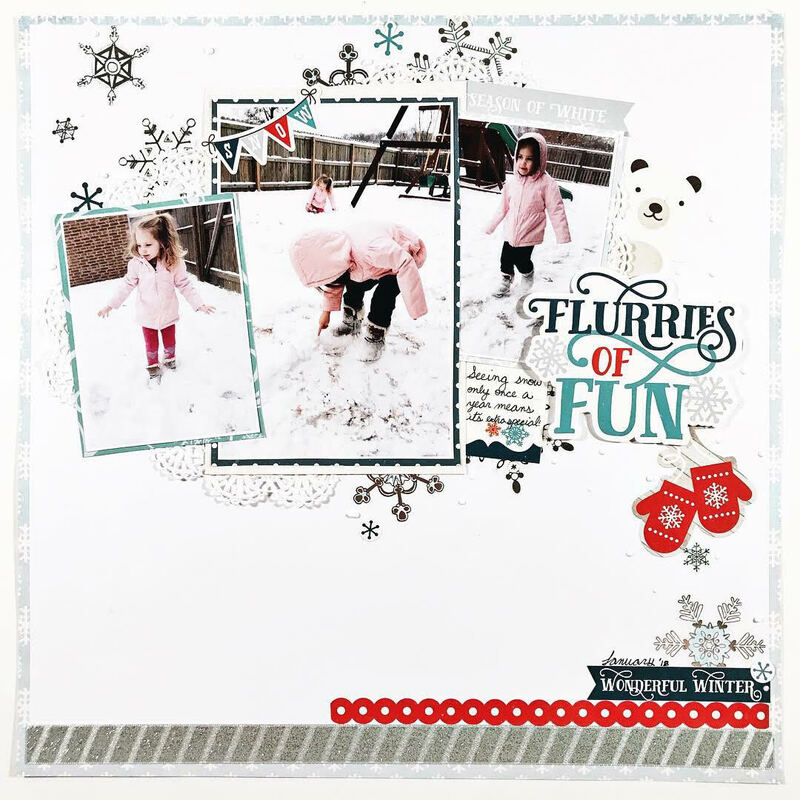 I then added in the snow flake stickers along with some of the stickers from the collection sticker sheet featured in this month’s ScrapbookingStore kit. I was even able to add part of my title using the sticker sheet as well as the adorable snowman. This art journal layout came together very quickly and is beginner friendly . 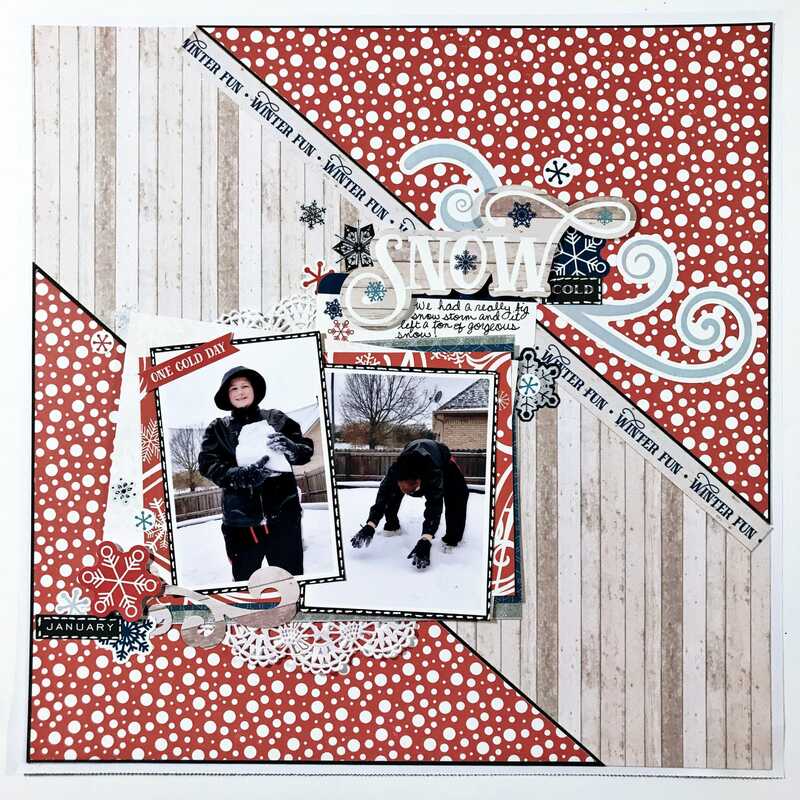 I love the end results and I loved the challenge of using a scrapbook kit on an art journal layout! These photos are from the blizzard of 1978. My parents were digging us out and my Dad even shoveled the roof due to the amount of snow we had. I used the barn wood side of one paper to tie in with the vintage photos. 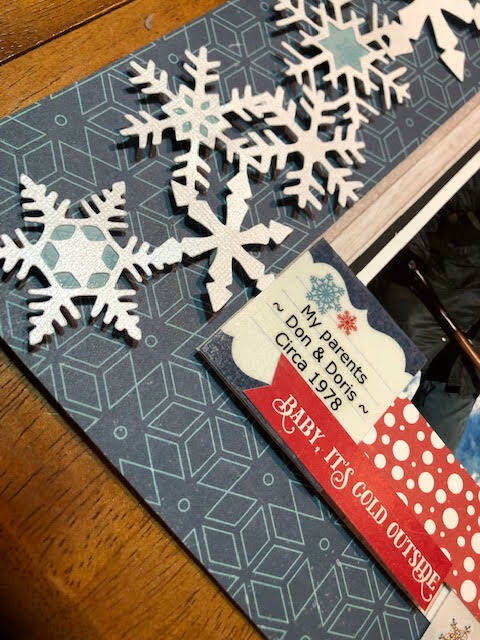 The snowflake cut file is from Etsy and I backed the cut snowflakes with paper from the kit. The journaling is printed on a transparency and glued to the front of the sticker. Items from my stash that I added are the puffy thickers for the title, black card stock behind the photo, white glitter card stock for the snowflakes and a bit of vellum. All other paper and stickers are from the kit. 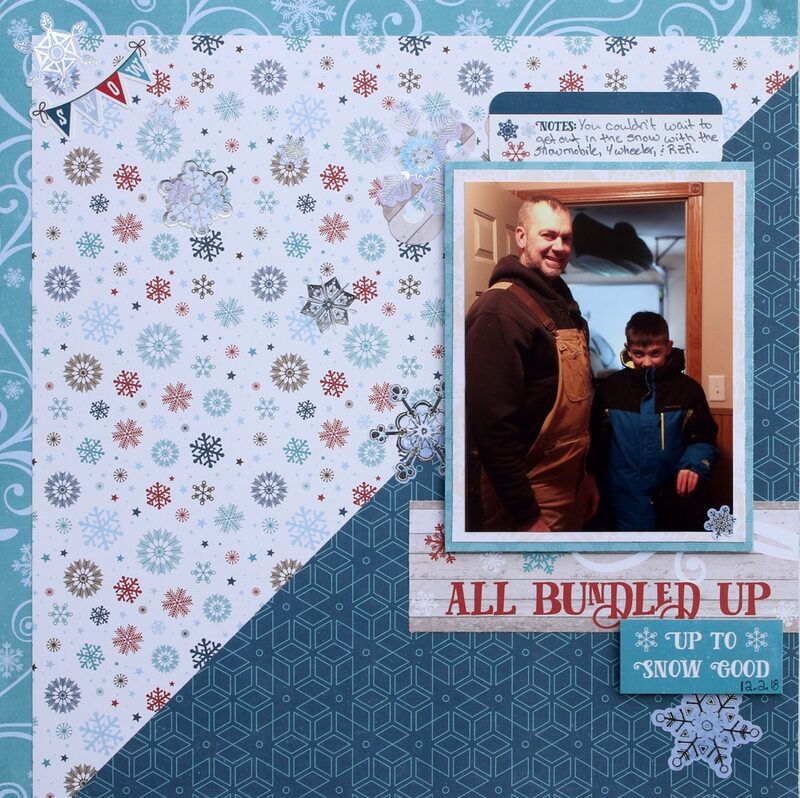 My husband and son are snow lovers, I’m a patterned paper lover, so January’s kit is perfect for us! As you can see, I love mixing and matching patterned papers. I usually start with one busier print (in this grouping I consider the multicolored snowflakes the busy print), and then choose more subdued prints that compliment the main pattern. Sometimes your photos can get a bit lost when you add a lot of patterned papers to a layout, so I like to group my embellishments around my photo to draw your eye to it. My absolute favorite thing from the upgrade part of the kit is the snowflake stickers. They’re a translucent vellum type sticker that has white, blue, and silver printing on them. They are so pretty in person making for a gorgeous addition to the layout! 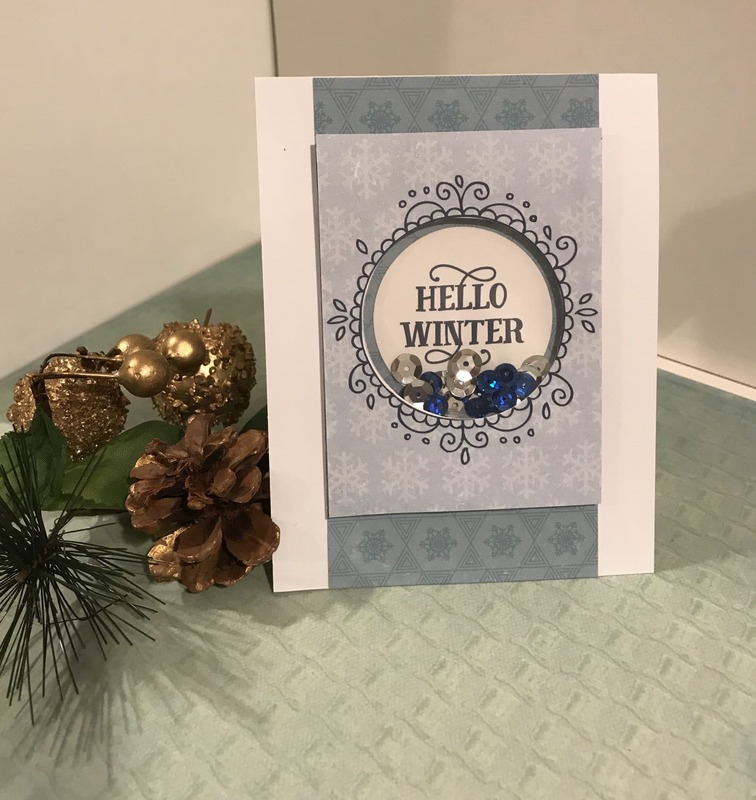 I decided that the “Hello Winter” cut apart would be perfect as a shaker card. I layered it with foam tape and added a few shades of blue and silver sequins. My second card I had fun picking from the beautiful selection of papers. I chose three of the patterned papers and added a scrap of solid red from my stash to help the layers pop! A little glossy accents made his nose shiny which made his adorable face even cuter! We hope this list has inspired you to get crafting! If you haven’t already, it’s not too late to sign up for our monthly subscription and get in on this AWESOME January Kit (only available until the end of the month). Just click on the button below to get yours today! As always, we’d love to see what you come up with! Tag us on Instagram or Facebook to show us what all you create! 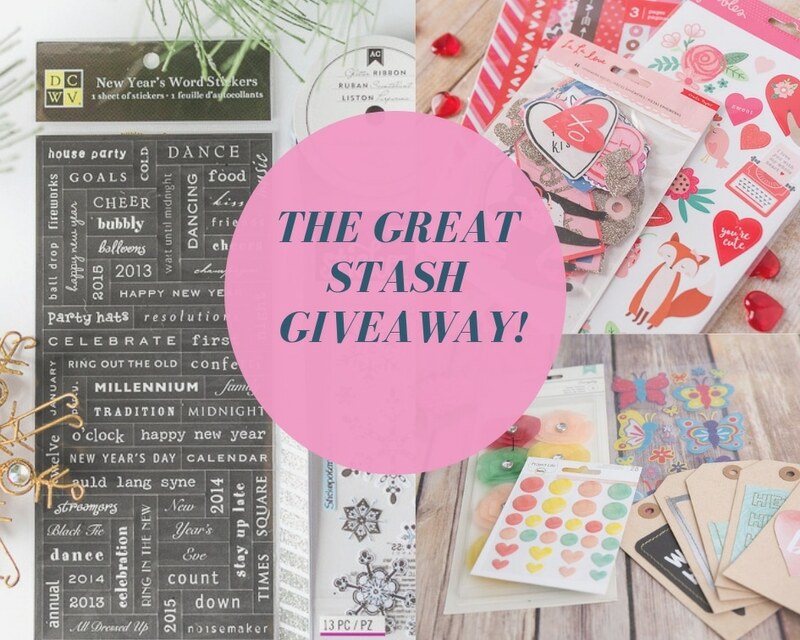 And don’t forget to follow us on social media to see all the great crafting ideas and inspirations we have to share with you!